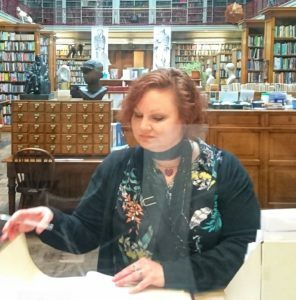 Dr Karen Baston is a historian, bibliographer, and freelance writer and researcher interested in aspects of the long eighteenth century especially in a British context. She specialises in early modern Scottish lawyers’ libraries, Scottish legal history, the history of the book, and social history. She has most recently been Project Manager for ‘William Hunter’s Library: A transcription of the early catalogues’ at the University of Glasgow and Research Assistant for the ‘Glasgow Borrowing Registers’ project, also at the University of Glasgow. She studied for her BA at the University of Detroit, her MA at Birkbeck College, and her PhD at the University of Edinburgh.